Hey, guess what. A draft post won't publish if you don't click "publish" when you schedule it. So here is the entire month's worth of Stash Reports! Pueblo, Colorado is known as the "Home of Heroes" because four Pueblo residents have been awarded the Congressional Medal of Honor. According to Wikipedia, only Weymouth, Massachusetts has more Medal of Honor winners. Pueblo also hosts the Quilt and Stitch Expo each April. It's my favorite quilt show, because most of the vendors are Colorado shops dedicated to quilters. As I look at my "stash bag" for this trip, I realize I didn't really buy a lot. Must be slipping, huh? 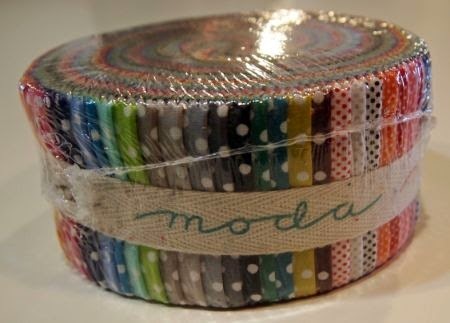 Here is Moda's new "Dottie" jelly roll. I love dots! 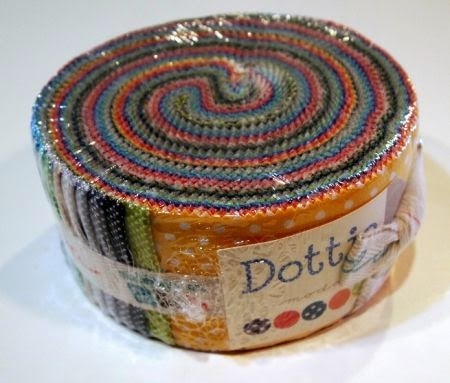 This jelly roll is designated for my August Jelly Roll Party sample for Ruth's Stitchery. The pattern is "Kissing Booth" from Freckled Whimsy. I always try to have something that reminds me of the county fair for August. Our county fair doesn't have a kissing booth, more's the pity. 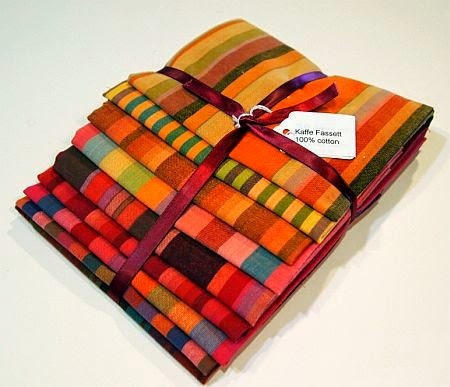 I scored a real deal on these Kaffe Fassett fat quarters from a shop in Westcliffe, Colorado, "Grammie Tammies." I'm starting to have quite a collection of Kaffee stripes, this might have to be the "quilt of the month" for May. I picked up some fat quarters of Moda's "Hearty Good Wishes" at Cotton Candy Sewing Shop in Loveland a few weeks ago. When I saw the jelly roll of this line of fabric at the expo, I hatched a great idea for a "jelly roll race" quilt. 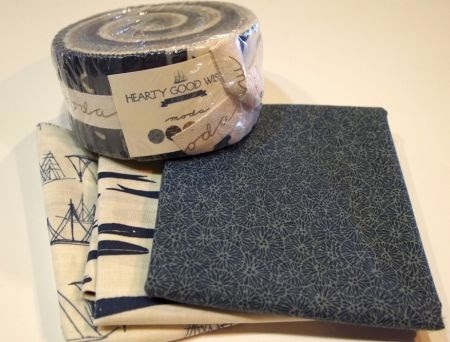 Make the jelly roll quilt, then use the dark blue to applique an anchor in the center. 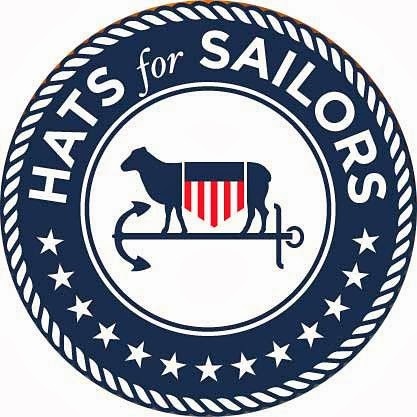 Now I just have to find a big anchor to trace around for a pattern! Randi always includes a cute pin with orders. I love this one! 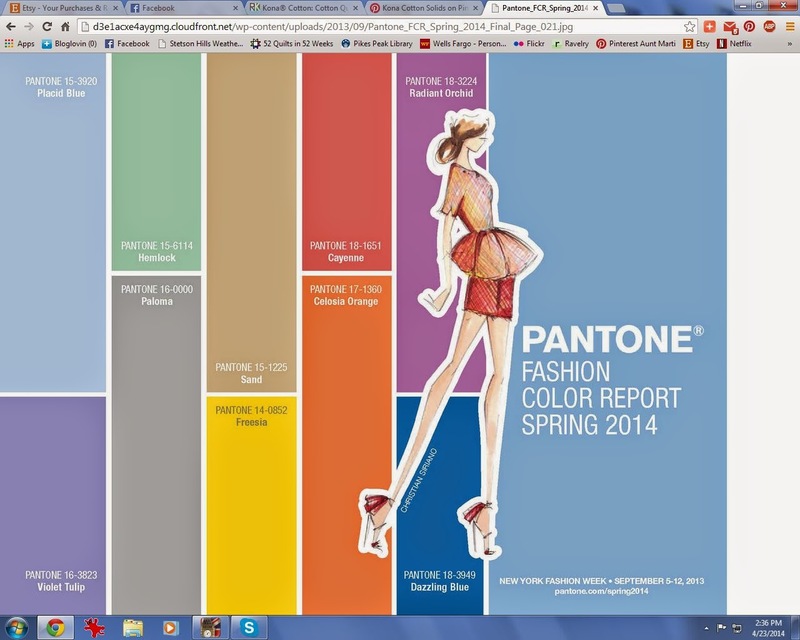 Here are the Pantone Spring 2014 fashion colors, so you can see how well the Kona cottons match! 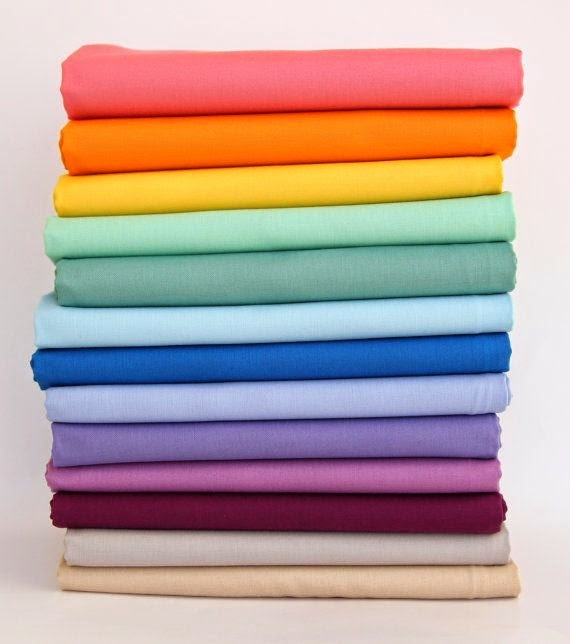 Psst, FreshSqueezedFabrics is having a big big sale on all precuts right now! The next weekend was the "Springtime in the Rockies" quilt shop hop. This shop hop used to be an ordinary shop how\p, where you drive to every shop on the list. Elder Son and I did the hop one year, 500 miles in one day. And that was before he learned to drive! Now the hop is held at the Larimer County Fair Grounds in Loveland, and all the shops have a booth inside the commercial building. More convenient, but I don't think it's as much fun. I did get to have lunch with friend Susan, from Cheyenne, so it was worth the drive. 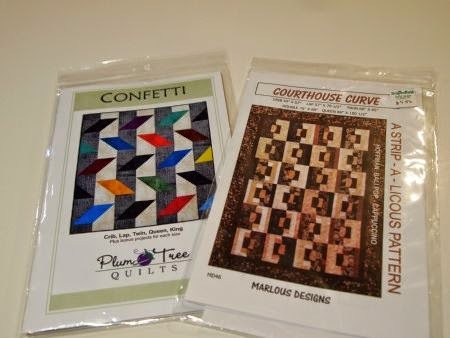 Did you see the episode of "Sewing With Nancy" where she demonstrated these patterns? You know how I love to have the "complete collection." 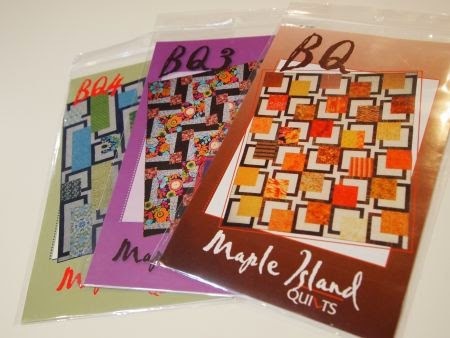 All I need is BQ2 to have all of the Maple Island "Big Quilts" patterns. Too late for this year, but I think "Confetti" would be great for a High School rodeo team raffle quilt! And "Courthouse Curve" is a possibility for Jelly Roll Party 2015. Rather than having one "shop hop" quilt where each shop designs a block, this year several shops designed a complete quilt for the hop. 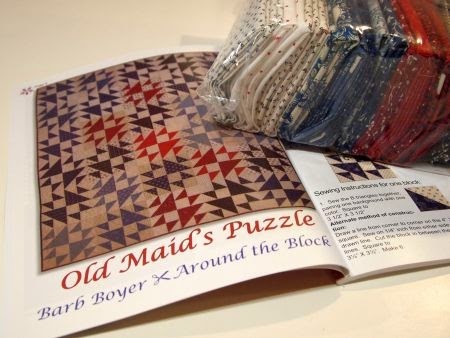 This is "Old Maid's Puzzle," designed by Barb Boyer of Around the Block Quilt Shop in Cheyenne. 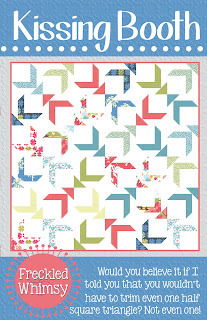 Not only my favorite shop on the hop, but my favorite quilt -- I bought the kit! At the Downton Abbey retreat, my friend Susan showed me this cool "pointer" tool. 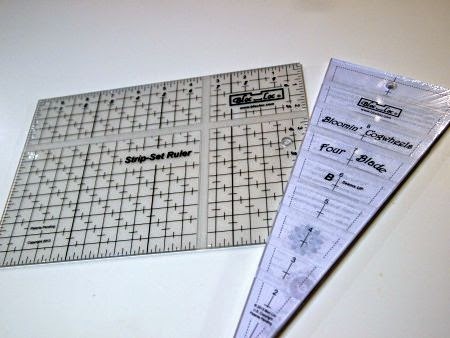 I'll demo the Sew E-Z Fingerthing in a future "Tuesday Tool" post. You've already seen the two new Bloc_Loc tools I bought at the shop hop. Really, for an entire month's shopping, this isn't a lot! Right? 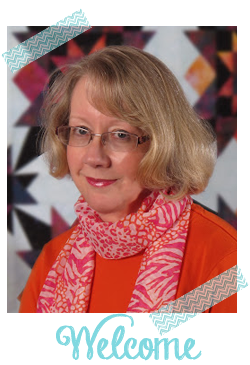 Tune in tomorrow to see my progress on Bonnie Hunter's "Celtic Solstice" quilt. Nice shopping! 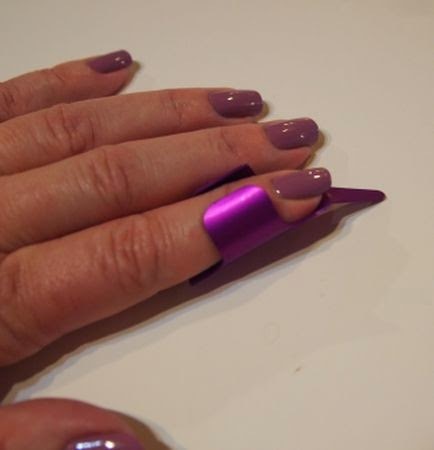 Love that your fingernails match the finger tool thingy. Great buys! I have a wedding in Loveland to attend soon, so I'll need to click through to the shopped you listed. 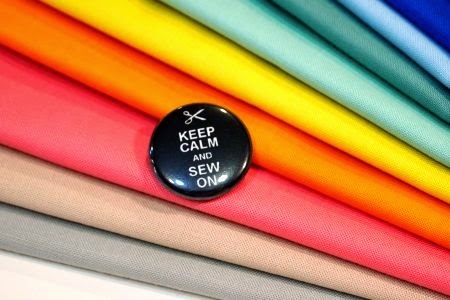 There is always time to stop at a quilt shop!!! Not much at all!!! And like Sarah - Love that your fingernails match the finger tool thingy. Love the stripes. I was Freecycled some amazing striped silk swatches that I can't wait to play around with in the near future. You inspire me to do that soon. Great buys. I love that hearty good wishes. Nice dotty blenders too. Shhh, don't tell me about the sale.